Our scholarship program is exclusively for graduating seniors from Stow-Munroe Falls High School. Good luck and Go Bulldogs! 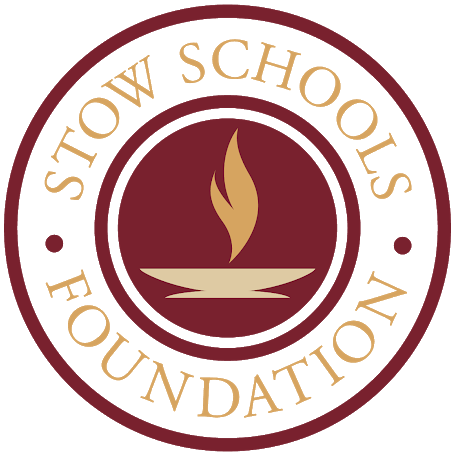 The Stow Schools Foundation established the Becky Artz Memorial Scholarship the fall of 2001 in order to honor Becky’s memory and to assist a Stow-Munroe Falls senior in their pursuit of a degree in education. Aspiring to become an Educator. Planning to attend a post secondary institution. Gifted with a marvelous intellect and a profound love of learning inherited from immigrant Ukranian parents, Catherine Galay Menapace was the first in her extended family to attend college. She graduated from Kent State and taught in Ohio high schools for twelve years. When her own children entered Holy Family and Stow High, Kay vigorously supported both schools, attending countless meetings as a tireless advocate of a quality education for all students. This scholarship was established in her honor by her husband, family and friends. 71 years after they graduated, the 1948 classmates join together to honor their deceased members and praise their school. They received a solid education, whether they went to work or on to college. With an exceptional aptitude and ear for music shown at an early age, Dorothy L. Kistler throughout her lifetime shared her gift with family and friends and instilled a love and appreciation for music in all who were fortunate enough to know her. – The scholarship is to go to a post secondary institution that the student will attend in furtherance of such pursuit. Financial need should be a consideration. The Horn Scholarship was the first trust established with the Stow Schools Foundation in 1988. It set an example for other funding to honor and remember significant people and accomplishments in the form of scholarships to be granted to the students of the Stow-Munroe Falls school system. The Horn Scholarship is funded by Ed and Pat Barr in honor of Pat’s parents, Merle and Marcella Horn. ELIGIBILITY: Candidate must be a graduating senior who has demonstrated exemplary qualities in service, scholarship, leadership and character. This scholarship is named for Jim VanGilder who served as the Principal of the Stow-Munroe Falls High School for twelve years. Mr. VanGilder was also the Director of Personnel and Staff Development for fourteen years and retired in 1992 after 40 years of service in public education. Jim’s wife, Ida, was his strongest supporter and gave him constant encouragement. Jim and Ida wish this scholarship to go to a Stow-Munroe Falls graduate who plans to attend a four-year college or university. The scholarship is open to any major field of study. The criteria for this scholarship is improvement in the student’s last three years in at least two of these areas: attendance, attitude, academics and school involvement. This scholarship was established in June 2000 by the Stow-Munroe Falls Rotary Club in honor of member James P. Banks and his wife Johann L. Banks. Mr. Banks has been an extremely active member of the Cuyahoga Falls and Stow Rotary Clubs and has served Rotary as a Governor of District 6630. Mr. Banks also spent many years of his career in at the University of Akron. In 1947, Norma began her career in business. Starting out as a pioneer for women in business, she dedicated her life to one employer and continues today as one of their most valued assets. She has been honored by the Who’s Who of American Women and was previously active in the Business/Professional Women of Stow. This scholarship is given to a female high school senior who desires to seek a career in business. Paul and Mildred Underwood were residents of Cuyahoga Falls. While they had no children of their own, the Underwoods loved children and made arrangements to benefit children from their estates. Paul died in 1983 at the age of 85 and Mildred died in 1997 at the age of 94. Both were extraordinary professionals who dedicated their lives to their families, their work, professional associations and to the community. The Underwoods established and operated a successful typesetting business in the Akron area. They served the community through the City Council, Lions Club, Masonic Order, Eastern Star and the Business Woman’s Professional Organization. – Pursue a four year undergraduate degree. – Must have been active in school and community. Robert Kerscher was a long-time trustee at Ohio Northern University. To be eligible for this scholarship, a student must be planning to enroll at Ohio Northern University. – The scholarship is open to any major field of study. This scholarship recognizes students who have worked hard to achieve their academic and career goals. This scholarship was established in 2017 to honor Susan Martucci. Mrs. Martucci served the Stow-Munroe Falls School District for many years as a teacher and administrator. She also served on the board of the Stow Schools Foundation. Charles Monteith was the first Mayor of the Village of Stow and the Mayor again when Stow first became a City. He served on the Board of education of Stow and Summit County. Mr. Monteith was an active long-time member of the Grange. This scholarship was funded in his honor by the Darrow Street Grange. – Desire to complete a college education in agriculture, family and consumer science, ecology or veterinary medicine. – Need for financial assistance. – Service to your community, church and school. – An athlete (preferably 2 high school sports or more); involved in music such as a band member, orchestra, or choir; active in the community via Church or non-profit organization. This $500 scholarship was funded by the Wysmierski family in memory of their mother, Terry Wysmierski. She worked for the Stow School system for over 30 years. She had a passion for helping students in need and encouraging them to pursue their education to the next level. You must be a graduating senior of Stow-Munroe Falls High School. message through music and her church. Akron to pursue the major of study she wanted. able to continue her efforts in helping others as they find their way into college. hearts of all who knew him. the Michael J. Johns Lifetime Achievement Award in 2010. Organization), helping to find ways to assist and support higher education for women. act with integrity, serve with love and work for peace. in the Stow-Munroe Falls School System. It is our great pleasure to carry out their wish. Long time residents of Stow, Dan and Kerry Russo purchased the Tavern of Stow in 2017 inspired by their memories of growing up around family and authentic homemade food. They have built the Tavern of Stow into an establishment where families and friends gather; and as local business owners in a community they love, supporting both community and education has been their mission. As restaurant owners, Dan and Kerry understand the importance of developing young service minded professionals to ensure great experiences continue to inspire others. Therefore, in keeping with their mission, they have created the Tavern of Stow Hospitality Management and Culinary Arts Scholarship.